Jewelry pieces in movies are something that people look forward to seeing. These pieces is included in the production of the whole movie upon which some people judge to say if the movie is indeed great, good or bad. Some movies can even have their storylines revolve around a particular piece of jewelry, like the movie The Girl With a Pearl Earring. Now, that’s one important piece of jewelry, that it inspired a painting, a book, and the movie! If you check out necklace display sections, you will see some pieces that are replicas of movie jewelries. There are some jewelry designers that have made themselves famous because of the pieces they designed for a particular movie. There are also who make money out of these jewelry pieces by creating something that is inspired by pieces seen from movies. One of the most replicated pieces that came from a movie is the Heart of the Ocean diamond necklace which was worn by the character Rose, played by Kate Winslet, in one of the most controversial scenes of the movie Titanic. This is one scene that has been imprinted in the minds of the moviegoers and that scene would not have an impact if not for the jewelry she wore. After all, Rose asked Jack, the character played by Leonardo di Caprio, to draw her wearing only the necklace, and nothing else! Another famous jewelry piece in the movies is the gold medallion from the Pirates of the Caribbean. The medallion is actually William Turner’s (the pirate played by Orlando Bloom) before Elizabeth Swann (played by Kiera Knightley) got it from him while he was unconsciously drifting in the ocean when they were young. That’s one memorable pendant with a skull design! Of course, for Twi-hards, there’s always the engagement ring given to Bella in the Twilight Saga series. The ring itself is silver, and is set with 20 diamonds, each at 0.5 carats! The production design of movies becomes more famous because of these jewelry pieces shown on the screen. If you see a piece of your movie or design set come to life by replicas hanging on the necklace display area of the store, then you can say that you have made an impact and your work will forever be remembered. Keeping your jewelry is an important consideration if you want to maintain its shine and luster. You need to take care of your jewelry pieces so that they could maintain their value and be safe from incidences of scratching and damage, which can decrease their worth. Placing them in jewelry boxes is the most common thing that women do to keep their jewelry safe and intact. Keeping the jewelry pieces in boxes help in keeping the pieces free from dust and other irritants that can cause damage. 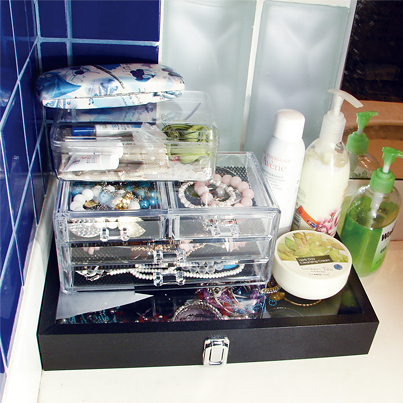 If you want to start to display your jewelry, then you can buy boxes that are made of acrylic. These acrylic jewelry boxes are nice to have because you can show off your jewelry without having to sacrifice the pieces. They are kept safe inside the box and there would be no worries about dust gathering on the pieces. The pieces can be easily seen with the see-through translucent property of the acrylic box. You can get those boxes with dividers so that the pieces can be arranged properly. There are also acrylic necklace display cases for your long chains. Other jewelry display ideas include a mesh frame for your earring pairs. Using a mesh frame for your earrings allow them to be delicately protected without the risk of scratching their surfaces and damaging their closures and hooks, at the same time make it easy to see them. 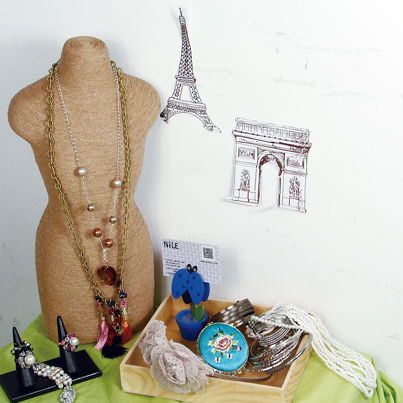 There are also necklace display hangers for your necklaces and acrylic earring holders for your precious pearl earrings. You can place them on your dresser for easy access. Try to go for hangers that are made of smooth materials or have velvet fabric linings. Stay away from displays made of materials that can be easily splinter or floss, as the material may scratch and eventually damage whatever piece it holds. Having an organized home is what every woman aims to have. These helpful suggestions can ease the burden of keeping your jewelry organized and arranged. 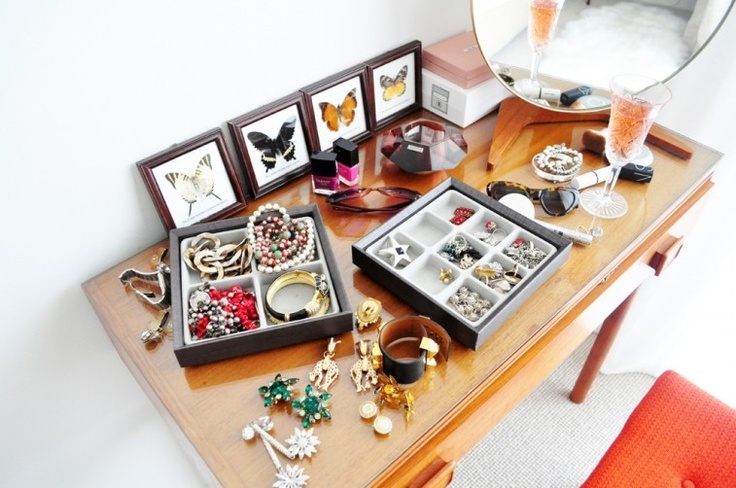 Organizing your jewelry can also help you check for pieces that are not used. You can decide on what to do with those pieces. An organized home makes it a better place to live in. Jewelry is one fashion accessory that should never be eliminated from a woman’s arsenal. It can add some oomph to an otherwise plain looking outfit. It can also add a pop of color which can be really pleasing to the eyes and catch the attention of onlookers. Fashion forecasters are predicting that big and bold accessories are still going to dominate the season. You can see if from the displays in department stores and jewelry stores that necklace display areas and even bracelets and rings features those big and chunky pieces that you see nowadays. These designs are predicted to continue on to the next season. Vibrant colors are still the fashion trends to date. This will also extend to jewelry and accessories. Jewelry of different materials like precious stones, metals, plastic, glass ceramic and wood are still going to be hot for the fashion conscious people. This is great because this means you can get pieces that are affordable because of the many options for the materials that are available. Necklace display sections of malls and department stores are brimming with different designs made of different materials. This season makes the people more connected to earth colors especially with the brown tones that are becoming more dominant even in nature. It is easy to incorporate these colors in your jewelry collection. The fall season is usually dominated by earthy colors – Materials with colors like brown, yellow, and orange tones are best used. There are also some in green and blue hues. Boho and tribal-inspired jewelry – The jewelry of this theme is perfect for fall. Wooden pieces with eccentric designs and prints are the common ones you see for this kind of jewelry. Bangles are also easy to spot as animal prints can easily be replicated in this kind of jewelry. Semi-precious stones are also a hit – Semi-precious stones like turquoise are also a hit during the fall because of its. Color. It can easily provide a pop of color in an outfit that makes it stand out. Rose quartz and those with old rose color can also be utilized. Over the years you collect tons of jewelry. Some of it valuable, some of it keepsake items, and some of it inexpensive costume jewelry. Nonetheless, after awhile it becomes hard to organize, store and display your earring, necklaces, watches, and other precious stones without it getting tangled and misplaced. When stashed away in drawers, it can also be forgotten. Have you ever purchased a pair of earrings, only to find a similar pair tucked away in a forgotten drawer? I think many of us have had this happen to us at least once in our lives. We use jewelry to adorn our outfits and bring life to our wardrobes..why not do the same in using it to dress up our homes? Below are some fun ideas to turn your favorite trinkets into beautifully organized displays for your home. 1. Group fancy pieces together on a tray for a designer inspired look. If you have strands of pearls, gold chains, and cocktail rings, group harmonious shades together for a high-end feel. 2. You can incorporate gemstones and minerals onto your end tables where you keep your reading light. It gives a nice touch of sparkle. 3. Dress up a gourd lamp with some pretty beaded necklaces for a fun, quirky look. 4. Dedicate an entire wall to necklaces! Find fancy knobs, vintage hooks and and wooden racks to create a unique arrangement. 5. Make a lavish bulletin board with designer fabric and silk ribbons. Hang your favorite jewelry on tacks or push pins. 6. If you have a drawer with a glass top you can invest in some pretty necklace display stands, earring holders and make your dresser look like a store jewelry case! Add lighting inside for an extra luxurious feel. Whatever you decide to do for your home jewelry displays, have fun with it! Be creative and let your jewelry and baubles enhance the beauty of your home. Send us your home jewelry display ideas! We'd love to feature it on our Facebook page! Categories: earring display, Earring Displays, Home decor, jewelry displays, necklace display, Necklace Displays, Nile Corp. Wearing big and chunky necklaces are on the rage nowadays. Models in pictorials for fashion spreads and magazines are wearing these kinds of accessories. When you watch the red carpet shows, you can also see movie stars and notable personalities wearing this kind of accessory. This is the trending fashion accessory as of today. Necklace display areas of your favorite mall have a lot of it, so this is the best place to go to. Wearing big jewelry is indeed a big leap if you are used to wearing dainty pieces. It can make a bold statement to any outfit. First timers have a hard time wearing these big pieces for the fear of looking awkward. Here are some tips you would like to keep in mind when you want to go with the trend of wearing big and chunky necklaces. This is a must for first time wearers and users. Go for the neutral colors first – It is best to go for the simple one-color necklaces. This will help you ease out in wearing big necklaces. This will also help you to get used to the weight as well as the size of these kinds of necklaces. The necklace display section of the accessories department of the mall would have a lot of these kinds to help you out. Contrasting color go best together – Make your necklace color a contrast of the color of your outfit for it to stand out. If you want to make a statement with the help of this accessory, this will be your best bet. Use less of the other pieces – If you are wearing a big necklace, then your other jewelry pieces should be simple in design so that it will not clash. This will help the onlookers focus on only one piece of the accessory. This will also make your outfit look united. You can wear simple stud earrings from your rotating earring display. Be aware of the neckline of the outfit – Big necklaces are best worn with high cut but low collared shirts or shirts that show a lot of the neckline. Strapless dresses also go best with these kinds of necklaces. Fashion plays a big role in women’s lives nowadays. It is important to look good before stepping out of the house even if one goes out just for a few personal errands. You will never know who you will be meeting in town so it is best to look good. Also, it makes one feel more confident if you know that you are dressed well and fashionable. This is the reason why fashion magazines are making a kill and is considered to be a big industry in the world of fashion. This is where you can see the trending pieces in dresses and accessories. You can see an array of necklace display mannequins which showcases the latest designs that are notable as well as affordable.If you go to your favorite ladies fashion and jewelry section, you will see various necklace display cases with different designs of statement necklaces. This is considered to be the trending fashion jewelry of the season. You see celebrities like Sarah Jessica Parker, Jessica Biel, Rihanna, Emma Stone and even Michelle Obama rock the red carpet with their gorgeous outfits accessorized with an eye-catching statement necklace. So what makes a statement necklace? Most statement necklaces that you see are “chunky” meaning they are made up of large pieces of jewelry material pieced together to form one eye-catching piece of a necklace. These pieces are considered bulky as they are huge pieces worn around the neck. You would need a special necklace display case where you can store it so it will not get ruined or scratch because if not, you can run the risk of ruining your statement necklace. The size is also emphasized as it is usually worn with the hair up in a bun to make sure that the beauty of the necklace is seen. This is another term for statement necklace. This is called “bib necklace” is because the size itself covers a huge area of the neckline making one looking like she is wearing a bib similar to that of a baby.